vocalisms is a regular feature that presents selected tracks from voca, the Poetry Center's online audio video library of more than 800 recorded readings, spanning from 1963 to today. 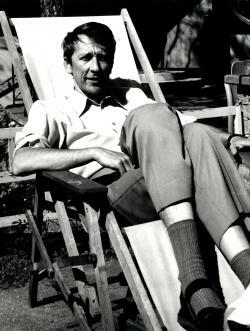 In one of my favorite photographs included on voca, Nobel Laureate Tomas Tranströmer reclines in a lounge chair outside of the Poetry Center, his stylish combination of socks and sandals visible in the foreground. Taken by Lois Shelton, director of the Poetry Center from 1970-1990, the photo captures Tranströmer in a relaxed moment, just on the edge of speech. Enjoy the photo while you listen to “Tracks,” the opening poem from his 1974 recording, read in both Swedish and English. With nearly every recording on voca, you’ll find a photo of the reader at the time of their reading, taken by talented Poetry Center staff members who make time for photography among their many other regular duties. The photographs on voca constitute a rich visual history of poetry across the past five decades, set against the distinctive backdrop of Tucson, Arizona. When you visit the voca homepage, a randomized selection of photos appears on the left half of the page—hit refresh to get a new set of photographs to enjoy.